The remains of Spc. 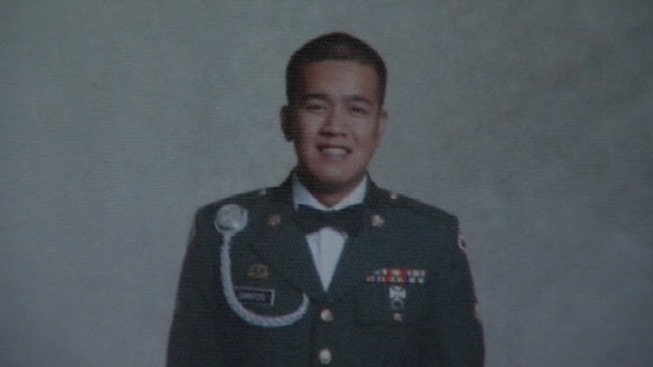 Delfin M. Santos Jr., who was killed last month in Afghanistan, are now back in the Bay Area. His body was flew to Moffett Field Friday afternoon where it was met with a full military honor guard. From there, his casket was transported to Oak Hill funeral home in San Jose. Along the way, many overpasses above Highway 101 were flag-draped. A visitation will be held at Oak Hill both Saturday and Sunday. Saturday, from 5 p.m. to 9 p.m.
Sunday from 4 p.m to 9 p.m.
Santos' funeral will be held Monday at noon and large crowds are expected according to funeral director Bob Whitlach. Last month, Santos' convoy was hit with a improvised explosive device while a group of on its way to deliver books to Afghan children. Santos' unit was accompanying a group of American officials and their Afghan counterparts who were on their way to school in Qalat, the Zabul province's capital. Staff Sgt. Christopher M. Ward, 24, of Oak Ridge, Tenn. and Spc. Wilbel A. Robles-Santa, 25, of Juncos, Puerto Rico were also killed in the attack. Anne Smedinghoff, a 25-year-old American diplomat. was also killed in the attack which was the deadliest day in Afghanistan since Aug. 16. Santos joined the Army in February 2007 and arrived at the unit in May 2011. He was on his second deployment, according to the DOD. Santos' family said he was the youngest of 17 children. They said his father was a POW in World War II and was part of the Bataan Death March. Santos was following in his father's footsteps. Delfin Sr. fought against the Japanese during World War II and was held as a prisoner of war in the Philippines. His father was buried in the Philippines.